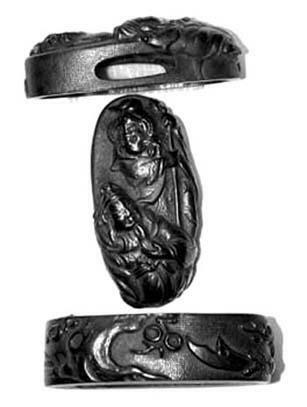 The kashira portrays two warriors, whilst the fuchi carries an old cherry tree with a a bisento. This is a little startling, considering that this is a copy of an original antique piece. Bisento were uncommon weapons, probably of Chinese origin, and largely connected with ninja. Sized for either a small katana or wakizashi, this set is available in steel or blackened silver.